As the U.S. prepares to commemorate the 100th anniversary of entering World War I, BEHIND THE DOOR (1919) offers a unique time capsule of the period. Legendary producer Thomas H. Ince and director Irvin V. Willat made this—“the most outspoken of all the vengeance films” according to film historian Kevin Brownlow—during the period of World War I-inspired American patriotism. Thomas Ince produced and directed CIVILIZATION in 1916, an anti-war film which was part of Hollywood’s support of President Wilson’s policy of staying out of WWI. But when the United States entered WWI, all of Hollywood supported the war effort, including Ince. After the War, the studios were making films about people healing from the horror of the ware and for better understanding of the German people who were caught up with war fever of that time in Europe. The Thomas Ince Studio backlot was used for the village scenes and the water scenes where the battleships and U-Boat encounters were taken in San Pedro Harbor, where Bosworth, the star of the film, did his own stunts. This newly restored edition, produced by Flicker Alley, represents the most complete version of the film available since 1919, thanks to the collaboration of the San Francisco Silent Film Festival, the Library of Congress, and Gosfilmofond of Russia. The numerous bonus features include the re-edited Russian version of the film, outtakes, and an in-depth interview with renowned film historian Kevin Brownlow. • Russian version of BEHIND THE DOOR: The re-edited and re-titled version of the film that was distributed in Russia, with musical accompaniment by Stephen Horne. • Outtakes from BEHIND THE DOOR: Featuring music composed and performed by Stephen Horne. 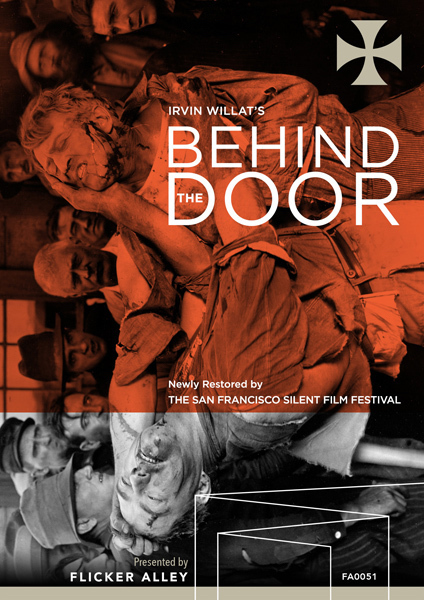 • “Restoring Irvin Willat’s BEHIND THE DOOR”: A behind-the-scenes look at the restoration. • “Kevin Brownlow Spotlights Irvin Willat”: Film historian and Honorary Academy Award winner Kevin Brownlow spotlights director Irvin Willat.